8 Great Summer Activities for Kids – Indoors and Out! Hot? Wet? Must be summer in Hong Kong! Here are 8 great summer activities for kids to do indoors and out! Summer is a challenging time for busy mums in Hong Kong: your kids are off school and the weather report calls for both sun and rain. We have collected 8 Great summer activities for kids from our ActivityBoxes that you can do either indoors or outside. So whatever the weather, you can feel confident that you have a plan for fun learning activities come rain or shine. Ideas – Never be at a loss for something to do! 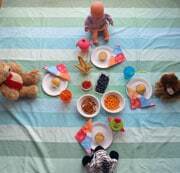 Songs & rhymes, art, games, movement and even snack activities to do together with your child! Parks are full of colours throughout the year, so take advantage of the opportunity for fresh air and exercise to also teach colours! Say “Can (your child’s name) touch something yellow (green, red, etc.)”? You can play the colour game at other locations like shopping malls, at home looking out the window or just walking down the street. 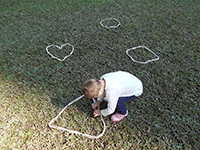 Playing shape hopscotch in the park or playground is a fun way to learn that shapes can come in many sizes. Then try different actions while moving along the shapes: jump, run, hold hands and jump together, skip, walk backwards and sideways! If you have a ball you can bounce the ball in and out the shapes or try throwing the ball into the shapes. Identify shapes you can see as you walk to and from the park. Don’t forget to spot the shapes in the park equipment! You can twist a few pieces of string together to make a thick rope effect which show the shapes better. Take your child on a make believe adventure through the grass, over a tree through the mud and into a cave. And what do you find? I see some grass. It’s very tall grass. Can’t go over it. Can’t go under it. Gotta go through it. I see a tree. A very tall tree. Can’t go over it. Can’t go under it. Gotta chop it down. I see some mud. Ooey-gooey mud. I see a cave. A dark spooky cave. Can’t go over it. Can’t go under it. Gotta go inside it. I see something furry. Something big and furry! (SCREAM) It’s a LION!! RUN!!! and run inside and slam the door! The chorus to sing after each verse: Going on a lion hunt. But I’m not scared! Explain to your child that it is very hot in Africa so we need to take a bag with some important items. E.g. water bottle, snacks, hat, sunglasses and binoculars to see what is very far away. Explain that in Africa there are a lot of tall and short grassy areas, muddy pools, caves in the mountains and tall trees. Find some open space, outside at the park or grassy area on a nice day! First, gently throw the ball underhand to the child. Perform each activities several times with the child. They love repetition and this is how they learn. Show your child some of your ball skills, they will delight in watching you kick the ball far or throw it high! Combine the ball games with snack time or lunch and have a picnic at the park or home. On a rainy day you can try this indoors with balloons! Can you move and sound like an insect? I think you can! The goal is to have your child move and use their imagination. Have fun! Bee: fly fast and make buzzing sound, sting with your bum! Spider: crawl fast and catch a fly! Fly: fly fast and stop/land, then quickly fly away again; someone is trying to swat you! Ant: crawl with something on your back as ants are strong! This movement activity is great for outdoor play but can be just as much fun indoors on a rainy day. If you are at the park, let your child pretend to be the different insects when they are playing on the park equipment. Have you met your shadow friend? They are ready to play on a sunny day! Explain that their shadow will always copy everything they do! Move around and change directions so he can see what effect it has on your shadow. Pretend your shadow is chasing you! Next jump on their shadow and say “tag you are it” and tell them to try and catch your shadow! This can be an indoor activity in a dark room with a torch or small lamp. Make hand shadows on the wall. Open and close your fingers. Hold up some of their toys and see their shadows. When you are outside to look at the shadows of different objects such as plants, trees, people, park equipment, cars, trucks, lamp posts and even dogs and birds flying by. Whether rain or shine, picnics are always fun! Don’t forget to pack a ball and bubbles for some exercise and fun play! Use disposable paper plates, bowls, cups or plastic items. Buy some fun, colourful serviettes to use on your picnic. Invest in a small cool bag if you don’t already have one! Never by bubbles from the store again! 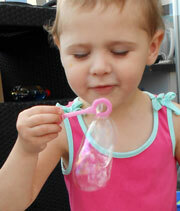 Then let your child gently blow bubbles toward you and while you hold out the sheet of paper to catch the bubbles. Take turns blowing and catching the bubbles to see your artwork! Cookie cutters are our favorite non-traditional option for medium-sized bubbles and a manipulated wire-hanger is great for gigantic bubbles. Make your own bubble racquet by taping two wooden chopsticks to a paper or plastic disposable plate. Substitute simple sugar for glycerin. 1 part sugar to 1 part water heated in microwave or pan. Let cool. How did your child like this activity?